Evernote's latest app update includes a special "Post-It Note Camera." Post-It Notes may the most iconic paper product out there, but they live in an increasingly digital world. 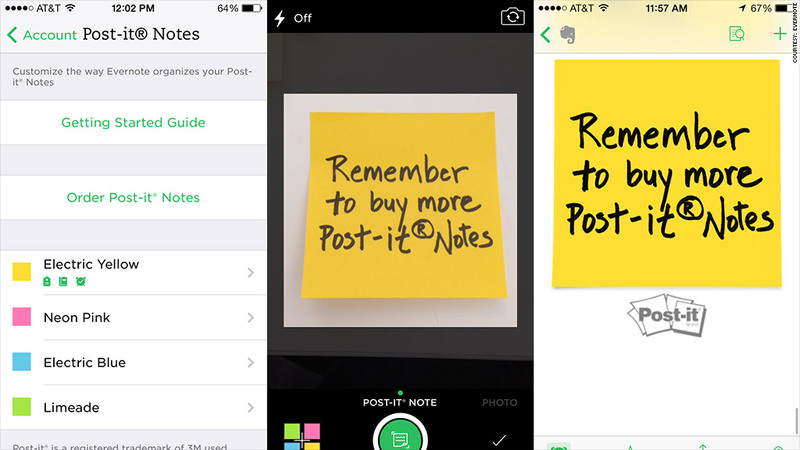 A new partnership with the Evernote app brings Post-Its into consumers' mobile devices. Evernote is an organization app that lets its 75 million users save items like notes and audio files, and access them across mobile devices and desktops. Evernote's latest mobile app update, released Thursday for Apple's (AAPL) new iOS 7, includes a special "Post-It Note Camera." The feature lets users take photos of Post-It Notes and upload them to Evernote, who uses handwriting recognition technology to make the contents of the notes searchable. Users can also organize the Post-It uploads by color, assigning a category to each hue, and add information like reminders and due dates. "The idea is that, regardless of how much we hear about everything going paperless, that's truly not the goal," said Jesse Singh, head of stationery and office supplies at Post-It owner 3M (MMM). "Our research shows that the majority of people still want to jot things down in an analog form.," Singh added. But they're obviously using lots of devices as well, and we think this bridges the gap." From Evernote's perspective, partnering with Post-It is an opportunity to get the app's name in front of millions of customers. 3M sells 50 billion Post-Its per year. "There are few products made in the past century that are as iconic as Post-It," said Evernote CEO Phil Libin. "As an app company, we want to reach the real mainstream audience, who may not be in line to download every app's latest update. Post-It customers are mainstream by definition." Evernote inked a similar deal with Moleskine last year, which lets users upload pages from the high-end notebooks. Evernote's Post-It Camera will work with all types of Post-It Notes, Libin said, and he admitted it "would probably also work with knock-offs" that look similar to the brand-name products. 3M will also release a limited number of Post-It packages that include a free 30-day subscription to Evernote Premium, which includes one gigabyte of storage. That subscription usually costs $5 a month or $45 per year. The two companies will split sales from Post-Its and Evernote app downloads. More importantly for Evernote, 3M will start putting the app's name and logo on all Post-It packages, Libin said. "We didn't want it to be like a 'Hobbit'-themed limited edition product," Libin said. "It really is about the mainstream future of both brands. It's one of the most exciting things that has happened to us as a company."